Mechanosensitive ion channels convert external mechanical stimuli into electrochemical signals for critical processes including touch sensation, balance, and cardiovascular regulation. The best understood mechanosensitive channel, MscL, opens a wide pore, which accounts for mechanosensitive gating due to in-plane area expansion. Eukaryotic Piezo channels have a narrow pore and therefore must capture mechanical forces to control gating in another way. We present a cryo-EM structure of mouse Piezo1 in a closed conformation at 3.7Å-resolution. The channel is a triskelion with arms consisting of repeated arrays of 4-TM structural units surrounding a pore. Its shape deforms the membrane locally into a dome. We present a hypothesis in which the membrane deformation changes upon channel opening. Quantitatively, membrane tension will alter gating energetics in proportion to the change in projected area under the dome. This mechanism can account for highly sensitive mechanical gating in the setting of a narrow, cation-selective pore. Piezo ion channels, Piezo1 and Piezo2, are mechanosensitive channels (MS channels) that underlie force-detection in eukaryotic cells (Coste et al., 2010; Wu et al., 2017). The number of cellular processes found mediated by Piezo channels is large and growing at a rapid rate (Eisenhoffer et al., 2012; McHugh et al., 2012; Pathak et al., 2014; Li et al., 2014; Cahalan et al., 2015; Alper, 2017). Their essential biophysical characteristics include responsiveness in gating to mechanical force (i.e. mechanosensitivity) and selectivity of the pore for cations (Gnanasambandam et al., 2015; Lewis and Grandl, 2015). Together, these characteristics allow Piezo channels to serve their many biological functions, including the transduction of mechanical forces into electrical signals in sensory neurons (Kim et al., 2012; Faucherre et al., 2013; Woo et al., 2014). In-plane area expansion lowers the free energy of a channel-membrane system under tension. Analog of a membrane under tension showing tethered weights in a gravitational field pulling the membrane taut, adapted from Ursell et al. (2008). (a) When the channel is closed, potential energy from the weights is high. (b) When the channel opens and in-plane area expands, the weights are lowered, and the potential energy of the system is decreased. In MscL the 20 nm2 physical expansion determined by structural and biophysical analysis (Perozo et al., 2002; Sukharev et al., 2001; Corry et al., 2010) corresponds well to the tension dependence of gating estimated in the most carefully executed functional experiments (Chiang et al., 2004). The principle of mechanosensitivity exhibited by MscL suggests a simple recipe for mechanosensitivity in general: couple pore opening to in-plane area expansion. But as a general solution this principle seems problematic for Piezo channels. It works well for MscL because that channel functions as a ‘pressure release valve’, permitting bacterial survival in the face of osmotic shock (Sukharev et al., 1993). The wide pore opening in MscL, associated with a conductance of approximately 3 nS and complete lack of ion selectivity, naturally fits with a large in-plane area expansion and therefore high mechanosensitivity (Sukharev et al., 1993). By contrast Piezo channels have conductance values around 30 pS (100 times smaller than MscL) and are cation selective, characteristics that are incompatible with a wide pore (Coste et al., 2010). Yet Piezo channels are highly mechanosensitive (Lewis and Grandl, 2015; Cox et al., 2016). Somehow nature must have separated area expansion from pore diameter. In an attempt to understand how this was accomplished we have determined a structure of the mouse Piezo1 (mPiezo1) channel, which exhibits many differences in its molecular detail and global interpretation when compared to an earlier structure (Ge et al., 2015). Based on this new structure, we propose a mechanism for understanding Piezo channel mechanosensitivity. 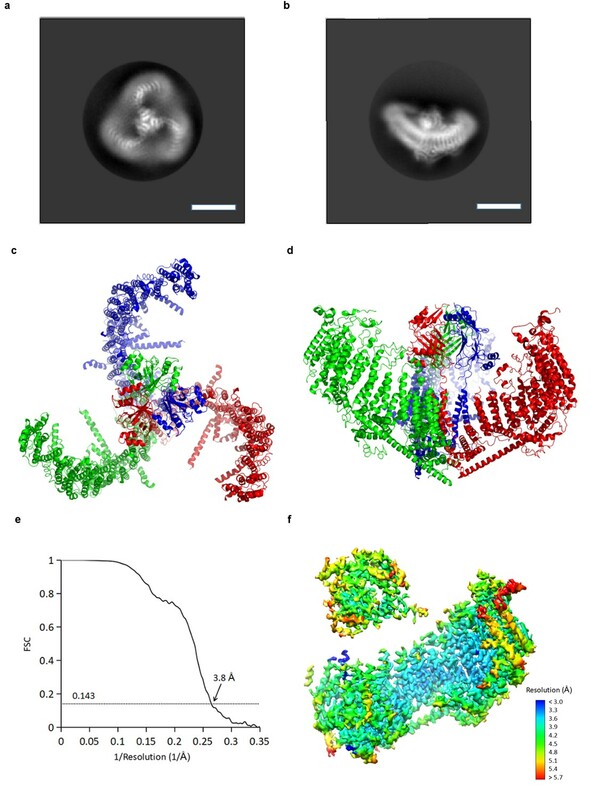 Using cryo-electron microscopy (cryo-EM) we determined a structure of mPiezo1 to an overall resolution of 3.7 Å (Figure 2 and Figure 2—figure supplement 1). Viewed down its 3-fold axis, the trimeric Piezo channel is a triskelion with extended arms (Figure 2a,c); from the side, it is curved as shown (Figure 2b,d). The cryo-EM map shows greatest detail near the 3-fold center (local resolution 3.2 Å to 3.6 Å) and less detail near the periphery (local resolution 5 Å to 6 Å) (Figure 2—figure supplement 1e). To improve the map quality, symmetry expansion was conducted with focused refinement using a mask covering the central hub and one of the three extended arms. The resulting map showed improvement, especially at the periphery (local resolution 4 Å to 5 Å) (Figure 2f and Table 1). A crystal structure (PDB ID: 4RAX) was docked into density corresponding to the C-terminal extracellular domain (CED) and the remaining model (26 TM helices per subunit) was built de novo (Figure 2—figure supplements 2 and 3) (Ge et al., 2015). The refined structural model contains 1518 residues (out of 2547), with the N-terminal 576 residues and internal flexible loops missing. (a and b) Representative 2D averaged classes, viewed from the top (a), and the side (b), scale bar 10 nm. (c and d) Atomic model of the trimeric channel shown as ribbon diagram, viewed from the top (c), and the side (d). The three subunits are colored in red, green and blue, respectively. (e) Fourier shell correlation (FSC) curves calculated between two half maps after C1 masked refinement and post-processing in RELION. (f) Local resolution of density map from C1 masked refinement, estimated by Blocres. The map shown is low-pass filtered to 3.8 Å and sharpened with a b-factor of −200 Å2. Cryo-EM data collection, refinement and validation statistics. The structure’s extended arms consist of 24 helices arranged as six repeated 4-TM structural units (Figure 3a,b). Each unit is a left-handed bundle of four helices starting and ending on the intracellular side. The two extracellular loops (between the first and second, and third and fourth TM helices) are short and long, respectively, the latter being partially ordered and containing α-helices. The six 4-TM repeats assemble with each other also as a left-handed helix, causing the extended arms of the triskelion to spiral away from the trimer’s center, out of plane with respect to the central pore axis (Figures 2c,d and 3b). Adjacent 4-TM repeats are linked by a polypeptide chain that crosses the span of two repeats, owing to their relative orientations (Figure 3b). The interactions provided by an extended connection likely aid stabilization of the extended arms. The repetitive pattern of TM helices is well conserved for all six 4-TM units visible in the structure. Sequence analysis suggests that the pattern continues to the N-terminus (Figure 3—figure supplement 1–3). Therefore, it is likely that a Piezo subunit contains nine 4-TM units altogether (the first 3 of which we do not see) giving a total of 36 TM helices, which form the arms, plus two C-terminal TM helices that meet at the center of the trimer. We have numbered helices in our structural model accordingly (Figure 3a). (a) Cartoon representation of a monomer, rainbow-colored with C-terminus in red and N-terminus in blue, except for the first 12 TMs that are not visible in our structure. Helices within a single 4-TM unit are colored uniquely. Helices are shown as cylinders, loops as solid lines, and unresolved regions as dotted lines. C-terminal extracellular domain (CED) is simplified as a box. A ribbon diagram of 4-TM unit 6, consisting of TM 21 to 24, is shown in the left inset panel with N- and C- termini labeled. The right inset panel shows a ribbon diagram of the pore region, formed by TM37, TM38 and the PE helix from all three subunits. (b) A ribbon diagram of a monomer rainbow-colored as in A, viewed from top. Each 4-TM unit is highlighted in a red box with TM number labeled. The central hub of the trimer is formed by amino acids following TM36 (Figure 3 and Figure 6—figure supplement 1). At the center TM37-38 form a 3-fold symmetric channel lined by TM38, capped on the extracellular side by a CED, and extended on the intracellular side by a pore extension (PE) helix (Figure 3a and Figure 6—figure supplement 1c,d). TM37-38 are domain-swapped relative to TM1-36 (Figure 2c). The channel is surrounded at the level of the inner membrane leaflet by a layered, helical cuff. 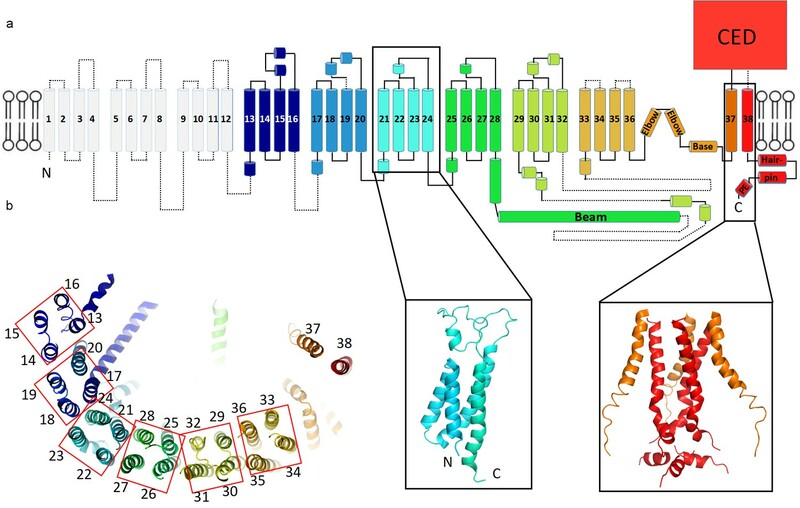 The cuff consists of ‘elbow’ helices (residues 2116 to 2142), a ‘base’ helix (residues 2149 to 2175) and ‘hairpin' helices (residues 2501 to 2534) from all three subunits (Figure 3a and Figure 6—figure supplement 1c,d). This solid cuff attaches the extended arms to the channel. Piezo also contains a long intracellular helix of 66 amino acids extending from the trimer center, radially out to TM28 (Figures 2d and 3). Referred to as a ‘beam’, this feature was observed previously (Ge et al., 2015), but modeled as two instead of one helix. In addition, linkers between 4-TM units contain at least one helix that runs perpendicular to the TM helices and to the extended arms (Figures 2c, 3 and 7b). These ‘cross’ helices are mostly hydrophobic and located inside of the micelle density, near the intracellular interface. A single subunit of Piezo removed from the trimer can be positioned reasonably well into the plane of a lipid membrane (Figure 4a). However, the detergent micelle containing a trimer is curved into a dome shape (Figures 2b,4b). The diameter of the dome opening is about 18 nm with a depth of about 6 nm. The central cap, formed by the CED, is actually located mostly inside the dome. The angle between the central pore axis and the beam in each subunit is about 60° instead of 90°, as we would expect if the trimer were located in a fully flattened membrane (Figures 2d,4b,c). Consequently, the hydrophobic residues on the TM helices (flanked by charged amino acids) form a clearly curved band on the trimer surface, matching the micelle density (Figure 4c). The distribution of charged amino acids on the extended arms of Piezo is consistent with the positive inside rule for membrane proteins (von Heijne, 1992). mPiezo1 trimer in curved micelle. (a) The same ribbon diagram of a monomer taken from the trimer, as in 3B, viewed from the side, with N- and C- termini labeled. Approximate locations of planar membrane interfaces are shown as grey lines. (b) Ribbon diagrams of a trimer in an unsharpened map, contoured at 6σ, showing micelle density. Top, side and bottom views are shown. (c) Surface representation of a trimer, colored based on electrostatic potentials in aqueous solution containing 150 mM NaCl, calculated using APBS, with positive shown blue, neutral white, and negative red. Top, side and bottom views are shown. The unusual shape of the Piezo trimer in detergent micelles led us next to test whether such a non-planar conformation can occur inside a lipid bilayer. Figure 5a shows a Piezo channel reconstituted into a small unilamellar vesicle consisting of POPE and POPG. The presence of a Piezo channel produces a local dome-shaped deformation of the membrane, with density corresponding to the CED visible inside the dome (the channel is inserted with its extracellular side inside the vesicle). The molecular model, without adjustment, conforms to the shape of the locally curved membrane near the Piezo channel (Figure 5a). mPiezo1 trimer locally curves membrane. (a) Small unilamellar vesicle containing Piezo without (left) and with (right) molecular model scaled to size and inserted into image. The lipid composition is POPE:POPG = 3:1 wt ratio. Scale bar 10 nm. (b) Small unilamellar vesicles containing no protein. The lipid composition is POPC:DOPS:cholesterol = 8:1:1 wt ratio. The spherical vesicle projection is highlighted by a white dashed circle. Scale bar 10 nm. (c) Small unilamellar vesicle containing Piezo without (left) and with (right) molecular model scaled to size and inserted into image. The lipid composition is POPC:DOPS:cholesterol = 8:1:1 wt ratio. The spherical vesicle projection is highlighted by a white dashed circle. Scale bar 10 nm. We observed that vesicles consisting of POPE and POPG tended to be non-spherical even in the absence of Piezo channels, possibly due to the truncated cone and inverted, truncated cone shapes of POPG and POPE lipids, respectively (Israelachvili, 1992). 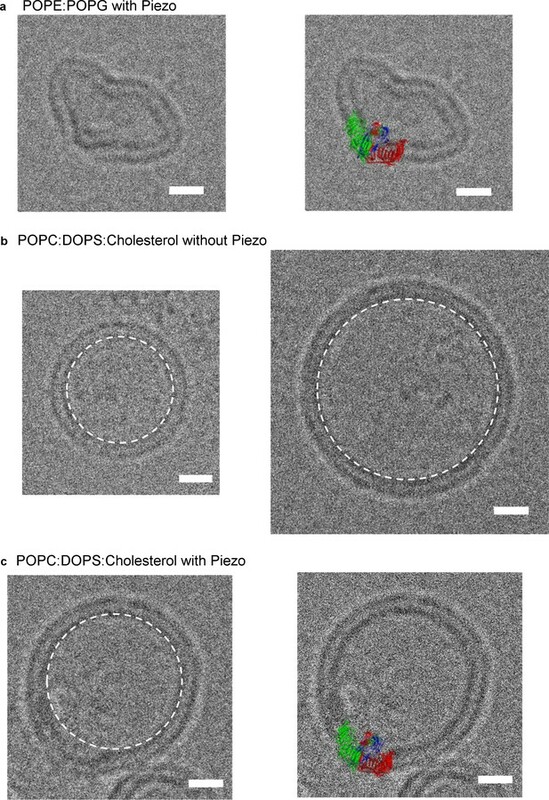 To further examine the ability of Piezo to deform membrane bilayers, we also analyzed vesicles consisting of mixtures of POPC and DOPS, with and without cholesterol. Vesicles of these lipid compositions are spherical in shape (circular in projection) (Figure 5b). As in POPE and POPG vesicles, Piezo channels deform the membrane by producing local membrane curvature (Figure 5c and Figure 5—figure supplement 1). We note that Piezo channels are almost always inserted with an inside-out orientation in vesicles so that the local curvature (of the dome) matches the global curvature of the vesicle. We conclude that Piezo deforms lipid bilayers locally into a dome shape. In cells, the dome will project towards the cytoplasm. A negatively charged patch of amino acids (E2257, E2258 and D2264) on the CED lies in close contact with a positively charged patch (R1761, R1762 and R1269) located in the extracellular loops of 4-TM units 2 and 3 (Figure 4—figure supplement 1). Hydrogen bonds and salt bridges connect E2257 to R1762 and D2264 in R1761 in a domain-swapped manner. These electrostatic interactions appear to stabilize the trimeric assembly in its curved conformation. The transmembrane pore, lined by TM38 and the PE helix, is closed (Figure 6a–c). At the level of the membrane inner leaflet, the pore radius at positions E2537, P2536 and M2493 is 0.1 Å, 0.4 Å and 0.3 Å, respectively. Estimated from the size of tetraethylammonium (TEA), which is permeable, Piezo should open to a radius of at least 4 Å (Gnanasambandam et al., 2015). When it does open, two rings of glutamate residues flanking either side of the narrow region of the pore (E2487 and E2537) likely account for cation selectivity through direct interactions with permeating ions (Figure 6a,c). Pore of the mPiezo1 channel. (a) Ion-conduction path viewed from the side. The distance from the pore axis to the protein surface is shown as grey sphere. Cα trace of the pore (TM37, TM38, hairpin and PE helices) is shown in yellow. Residues facing the pore are shown as sticks. Constricting residues are labeled. (b) Radius of the pore. The van der Waals radius is plotted against the distance from the top along the pore axis. Constricting residues are labeled as in A. (c) Stereo view of the side-chain density around constricting residues. The map is contoured at 6σ and sharpened with a b-factor of −200 Å2. The atomic model is shown as sticks, colored according to atom type: yellow, carbon; red, oxygen; blue, nitrogen; and orange, sulfur. The overall architecture of Piezo’s pore shares several similarities with P2X (Kawate et al., 2009) and acid-sensing ion channels (ASIC) (Baconguis et al., 2014) (Figure 6—figure supplement 1a,b). First, all three are trimeric. Second, the pores contain two TM helices and a large extracellular domain, which enclose a continuous ion-conduction path along the three-fold symmetry axis, including a central vestibule in the extracellular domain. Third, there are lateral fenestrations located below the extracellular domain and open to the pore, which is the actual ion-conduction path in P2X and ASIC (Kellenberger and Grutter, 2015), and could be the case for Piezo as well. Given their distinct genetic backgrounds yet similar overall structures, it is reasonable to hypothesize that the two TM helices with an extracellular domain are the core components for a functional and efficient trimeric channel of this type. Therefore, other components unique to Piezo, including the elbow, base, hairpin, and PE helices (Figure 3a and Figure 6—figure supplement 1c,d), are likely to be directly associated with mechano-transduction. These unique components are positioned in a cuff surrounding the narrowest region of the pore and therefore seem well positioned to influence gating. Upon mechanical stimulus, major conformational changes are expected in these components in response to movement of the triskelion arms to open the pore. Piezo has a central ion conduction pathway surrounded by extended arms composed of transmembrane helices. The most strikingly unusual feature of Piezo’s structure is that it does not conform to a locally planar membrane. Instead, its extended arms project approximately 30° out of the plane defined by the pore, incompatible with a flat membrane (Figures 2d,4b,c). The extended arms are also curved so that the entire structure takes the appearance of a 3-sided pyramid – inverted when viewed from outside the cell – that spirals from base to apex to form a semi-sphere-shaped dome (projecting into the cell). Hydrophobic helices lie perpendicular to the arms like cross bars between the arms, presumably to support the curved membrane as it conforms to Piezo’s non-planar shape (Figures 2,4,7b). Twelve N-terminal transmembrane helices are not resolved. These presumably extend the arms even further, however, given the curvature of the arms these N-terminal helices appear to coincide with the edge of the dome, far from the center, where the membrane becomes planar again. We note that a published low-resolution structure led the authors to conclude that Piezo resides in a locally planar membrane, with extended arms forming extra-membranous, extracellular blades (Ge et al., 2015). The structure we have described is fundamentally different in that the arms, composed of transmembrane helices, are inside the membrane and force the membrane to curve, as shown in images of Piezo reconstituted into lipid vesicles (Figure 5 and Figure 5—figure supplement 1). 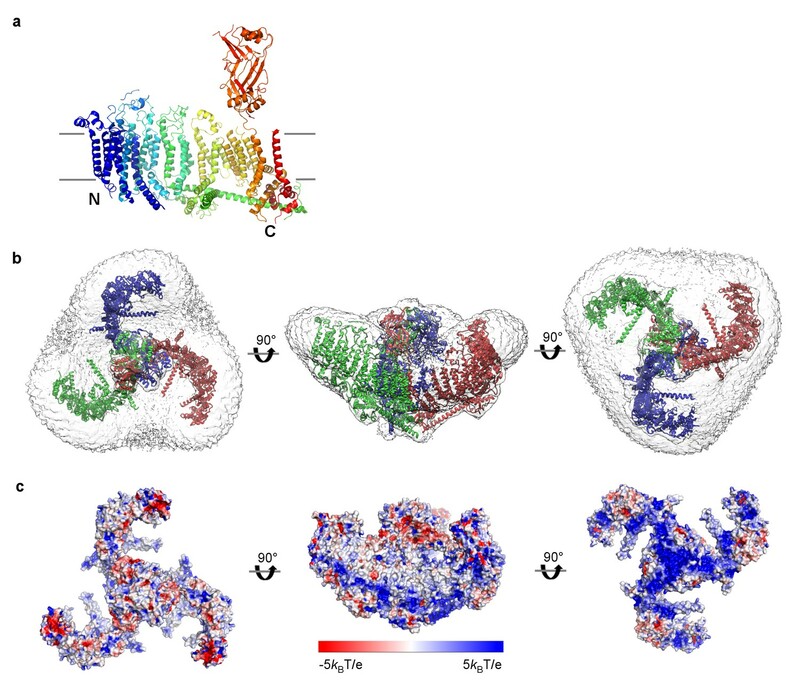 Model of tension-gating in mPiezo1. (a) Cα trace representation of a trimer placed in a semi-sphere-shaped membrane 3.6 nm thick, idealized from the curved micelle density. The mid-plane semi-sphere has radius of 10.2 nm and is centered 4.0 nm above the projection plane. The three subunits are shown in red, green and blue, respectively. (b) Ribbon diagram of a trimer in the idealized membrane. The ‘beam’ formed by residues 1300–1365 is highlighted in red, the cross-helices are highlighted in yellow, while the remaining protein is colored in grey. (c) Illustration of projection area (circle in top plane) changing as the surface curvature of the channel and local membrane (bottom plane) changes. (d) Theoretical activation curves corresponding (ΔGprot + ΔGbend)=20 kBT (red) or 40 kBT (blue) and ΔAproj = 20 nm2 or 60 nm2. The curves are generated through Po = (1 + Exp[(ΔGprot + ΔGbend) - γΔAproj])−1. We have approximated the shape of the membrane surrounding Piezo as a dome with a spherical surface of radius 10.2 nm, corresponding to the mid-plane surface of a membrane 3.6 nm thick (Figure 7a,b and Figure 7—figure supplement 1a). The shape matches closely but not perfectly the hydrophobic boundaries of Piezo, but it is sufficient for the following discussion. By appealing to the illustration of mid-plane area expansion in Figure 1, the structure of Piezo offers a plausible explanation for the origin of its tension-gating. If the semi-spherical dome becomes flatter (i.e. more co-planar with the membrane) when Piezo opens, then the channel-membrane system will expand. In MscL, widening of the channel’s diameter causes membrane plane expansion. In the proposed mechanism for Piezo, flattening of the channel and its locally surrounding membrane causes membrane plane expansion by transferring out-of-plane membrane area (the dome) into the membrane plane. In both cases weights are lowered in the ‘gravitational analog’ (i.e. free energy is reduced) (Figure 1). Because flattening does not constrain the pore to open wide, expansion and pore diameter are decoupled such that Piezo can exhibit its small conductance and cation selectivity, properties that are essential to its function, without compromising the ability to sense lateral membrane tension. In this proposed mechanism for Piezo, expansion of the membrane-channel system occurs when a curved, dome-shaped membrane becomes flatter (more planar). The expanded plane area corresponds quantitatively to the change in area of the dome that is projected onto the membrane plane, ΔAproj, and the resulting energy difference is γ ΔAproj (Figure 7c). For the simplified geometry shown in Figure 7 the semi-spherical mid-plane has a total mid-plane surface area of 400 nm2 and a projected area, Aproj, of 280 nm2 (Figure 7—figure supplement 1a). Therefore, if Piezo becomes completely co-planar with the membrane when it opens (i.e. so that its projected area equals its total area) then ΔAproj associated with opening would be 400 nm2 – 280 nm2 = 120 nm2. A membrane under tension γ would thus favor the open conformation by energy γ ΔAproj, corresponding to 42 kBT stabilization of the open state relative to closed at a membrane tension of only one tenth lytic value (~3.5 kBT/nm2), where kB is the Boltzmann constant and T the temperature in degrees Kelvin (Rawicz et al., 2000). If Piezo flattens only partially upon opening then ΔAproj will be less than 120 nm2 and the energy difference correspondingly smaller (Figure 7c,d). Recall that for MscL, the in-plane area change ΔA is ~20 nm2. This means Piezo has the potential for much higher tension sensitivity than MscL (equation 2, with ΔA = ΔAproj for Piezo). There are other possible origins of tension dependence in Piezo, related to changes in the size, geometry and chemistry of the protein-lipid interface associated with gating (Wiggins and Phillips, 2005; Ursell et al., 2008; Phillips et al., 2012). While these changes are still unknown, we suspect that the major origin of tension-dependent gating is the change in projected area, because it has the potential to be so large. The terms ΔGprot and ΔGbend refer to free energy differences intrinsic to protein gating and membrane bending, respectively. In this description, for the transition from closed to open, ΔGprot is positive (unfavorable) and ΔGbend is negative (favorable): these tend to cancel each other, with ΔGprot somewhat greater in magnitude so that the channel is closed when γ = 0. The equation predicts that lipid membranes of differing stiffness (i.e. different bending moduli) should influence gating through ΔGbend (i.e. stiffer membranes with a more negative ΔGbend should lead to channel opening at smaller values of membrane tension) (Figure 7d). That ΔGbend and ΔGprot are indeed tension-independent (such that d(ΔG)/dγ = − ΔAproj) is an assumption that needs to be tested through further measurement and analysis. We can only conjecture how changes in Piezo’s shape will open the pore. We think it is significant that a single subunit is compatible with a planar membrane, whereas the trimer is not. This is due to the abrupt angle at which the arms project from the pore (Figures 2d,4b,c): this implies that forces tending to flatten Piezo will produce the greatest stress at the region of attachment. This region coincides with the cuff of helices that surround the pore’s narrowest segment, presumably its gate. At first consideration a force directed along the triskelion arms toward the center of the trimer, associated with flattening of Piezo’s arms, might be expected to constrict the pore further. However, given that TM37-38 are domain-swapped relative to TM1-36, such a force will more likely push the ‘swapped’ pore-lining helices away from the center and open the pore. In summary, the structure of Piezo1 leads us to propose a membrane dome mechanism for the origins of its mechanosensitive gating. In this mechanism a dome of membrane, created by Piezo’s shape in its closed conformation, undergoes relative flattening upon channel opening. This mechanism does not require the application of a force pressing onto the dome (i.e. a force component normal to the plane of the membrane): lateral membrane tension alone will favor the flatter, opened conformation by a relative energy difference given by γ ΔAproj. Whether Piezo interacts directly with cytoskeletal or extracellular matrix proteins to modulate its mechanosensitive gating is unknown (Lewis and Grandl, 2015; Gottlieb et al., 2012). 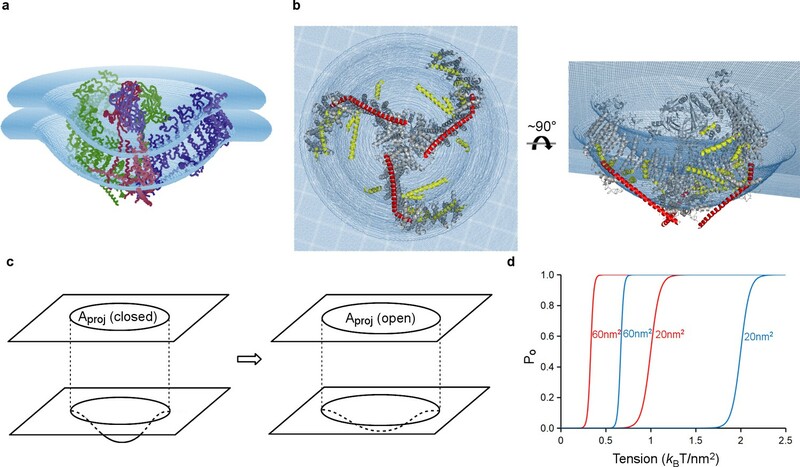 The membrane dome mechanism presented here is a hypothesis inspired by the highly unusual structure of Piezo and its demonstrated ability to curve lipid bilayers into a dome. Additional experiments will be needed to test this hypothesis. DNA encoding the full-length mouse Piezo1 protein (UniProt accession: E2JF22) in a pEG BacMam vector was used for expression. A green fluorescent protein (GFP) tag following a PreScission protease cleavage site (LEVLFQ/GP) was placed at the C-terminus to facilitate detection and purification. mPiezo1 was expressed using the BacMam method (Goehring et al., 2014). Briefly, baculoviruses carrying mPiezo1 were produced and amplified for two rounds in Spodoptera frugiperda Sf9 cells (RRID:CVCL_0549). HEK293S GnTI- cells (RRID:CVCL_A785) in suspension culture were grown at 37°C and infected with 10% (v/v) viruses at a density of ~3 × 106 cells/ml. At 15 hr post infection, 10 mM sodium butyrate was added to induce expression at 30°C. Cells were harvested at 48 hr post-induction. mPiezo1 purification was kept at 4°C at all times. Cell pellet from 2 L of culture were resuspended in 100 ml TBS supplemented with 1 mM PMSF, 1 μg/ml pepstatin, 1 μg/ml aprotinin, 1 μg/ml leupeptin, 1 mM benzamidine, 1 mM AEBSF, and 0.1 mg/ml trypsin inhibitor. After sonication, the lysate was clarified by centrifugation at 9500 × g for 15 min. The supernatant was then ultra-centrifuged using a Beckman Ti70 rotor at 42,000 rpm (rcf ~181,000 × g) at 4°C for 1.5 hr. Membranes were collected and the pellet resuspended and homogenized in 20 ml TBS containing all protease inhibitors as described above. The membrane resuspension was mixed with 20 ml TBS containing 2% digitonin and rotated at 4°C for 1.5 hr for protein extraction. Unsolubilized debris was removed by ultra-centrifugation using a Beckman Ti70 rotor at 42,000 rpm (rcf ~181,000 × g) at 4°C for 40 min. The supernatant was incubated with GFP nanobody-coupled Sepharose resin (Kirchhofer et al., 2010) equilibrated with elution buffer (150 mM NaCl, 20 mM Tris pH8, 0.05% digitonin, protease inhibitors) for 2 hr. After loading onto a column and collecting the flow-through, the resin was washed with 10 column volumes of wash buffer (300 mM NaCl, 20 mM Tris pH8, 0.05% digitonin, protease inhibitors). PreScission protease was added to the resin at a target protein to protease ratio of 20:1 (w/w) and incubated overnight with gentle rotation to cleave GFP. Target protein was then eluted with elution buffer and concentrated to 500 μl by Amicon Ultra centrifugal filter (MWCO 10 kDa). The sample was injected onto a Superose 6 Increase 10/300 GL column (GE Healthcare, Little Chalfont, United Kingdom) equilibrated with elution buffer. Peak fractions were pooled together and concentrated to 15 mg/ml. Cell lines were acquired from and authenticated by the American Type Culture Collection (ATCC). The cell lines were not tested for mycoplasma contamination. 3 mM fluorinated Fos-Choline-8 (FFC-8) was added to freshly purified mPiezo1 sample immediately prior to freezing. Quantifoil 400 mesh gold R1.2/1.3 holey carbon grids were treated with 10 s of glow discharge in reduced pressure air. A first drop of 3 μl protein sample was applied on the grid, incubated for 15 s, and manually removed using a filter paper with minimum touching. Then, a second drop of 3 μl protein sample was added, incubated for 15 s, and then blotted once for 1 s with −1 force and plunged into liquid ethane, using a Vitrobot Mark IV (FEI company, Hillsboro, Oregon) operated at room temperature and 100% humidity. The grids were then stored in liquid nitrogen until imaging. Automated data collection was controlled by SerialEM (Mastronarde, 2005) on a Titan Krios transmission electron microscope (FEI) operating at 300 keV equipped with a K2 Summit direct electron detector (Gatan, Inc., Pleasanton, CA). Micrographs were recorded in super-resolution mode, with a calibrated physical pixel size of 1.3 Å (a super-resolution pixel size of 0.65 Å) and a nominal defocus range of 1.0 to 2.4 μm. The exposure time for each image was 10 s fractionated over 50 frames with a dose rate of 8 electrons per physical pixel per second, corresponding to a total cumulative dose of of 47 electron per Å2, or 0.94 electron per Å2 per frame. Whole-frame motion correction was performed with gain reference applied and dose weighting using MotionCor2 (Zheng et al., 2017). The contrast transfer function parameters were estimated for all summed images using CTFFIND4 (Rohou and Grigorieff, 2015). RELION (Kimanius et al., 2016; Scheres, 2012) was used for image processing except where noted otherwise. 2000 particles were manually picked from a subset of images and extracted in a box size of 400 pixels and a mask diameter of 300 Å. Extracted particles were subjected to 2D classification requesting 20 classes, 12 of which showed representative views and were selected as templates for automated particle picking. 576,191 particles picked from 3414 images were then manually inspected to remove false positives, resulting in 521,152 particles. Another round of 2D classification requesting 100 classes was used to further clean up the dataset, which then contained 459,918 particles. Using CryoSPARC (Punjani et al., 2017) ab initio reconstruction requesting three classes with no symmetry imposed, an initial model was generated from 232,799 particles. This exhibited clear three-fold symmetry. After another round of symmetry-free ab initio reconstruction in CryoSPARC to remove non-symmetric particles, the resultant 161,986 particles were reconstructed to 3.74 Å resolution according a 0.143 cutoff criterion on the Fourier shell correlation (FSC) curve, by CryoSPARC homogeneous refinement with C3 symmetry imposed. Given that the peripheral region of each arm is relatively flexible, the triskelion is not strictly C3-symmetrical. Therefore, symmetry expansion was used to improve the peripheral resolution. The manually inspected 521,152 particles were first aligned in RELION 3D auto-refine with C3 symmetry using the CryoSPARC model as a reference. Using the relion_particle_symmetry_expand program, each particle was then replicated and 120° or 240° was added to the first Euler angle so that each of the three arms of every particle was rotated to the same orientation on the C3-symmetric ring. This 3-fold enlarged dataset was then classified in C1 with a mask covering only a single protruding arm without angular search. The best class containing 277,548 expanded particles was subjected to masked refinement in C1 with the mask covering the central hub and one arm. Only local angular searches were carried out during this refinement so that copies of the same arm do not contribute to the reconstruction more than once. The resultant map has a resolution of 3.8 Å after post-processing and allowed de novo model building for the peripheral region. Local resolution was estimated using Blocres (Cardone et al., 2013) with a kernel size of 19. The density map from masked refinement in C1 was sharpened by applying an isotropic b-factor of −200 Å2 in RELION post-processing for model building. A crystal structure of the mPiezo1 CED (PDB ID 4RAX) was docked into the map using UCSF Chimera (RRID:SCR_004097) (Pettersen et al., 2004) as a starting point. Manual building and refinement was performed in COOT (RRID:SCR_014222) (Emsley et al., 2010). Major helix elements were first placed into density and then connected by manually building the loops in baton mode. Sequence was registered by assigning the bulky side chains. The final model contains residues 577–600, 605–717, 782–875, 880–886, 892–1365, 1493–1578, 1655–1807, 1952–1997, 2015–2065, 2075–2411, 2424–2456, 2463–2546. Among them, side chains of residues 577–600, 605–717 and 1551–1578 were trimmed to Cβ, as these densities are less well-defined. In addition, a separate chain containing 16 alanine residues was modeled into density near the central bottom; these are not connected to other parts of the map. A trimer model of the channel was generated from a monomer by applying three-fold symmetry. The trimer model was refined with phenix.real_space_refine (Afonine et al., 2013) using secondary structure and non-crystallographic symmetry (NCS) restraints. MolProbity (RRID:SCR_014226) (Chen et al., 2010) was used to monitor the model geometry through multiple rounds of real space refinement and manual rebuilding. The refined model has a MolProbity score of 1.73, a clashscore of 4.84, with 0.25% rotamer outliers. The Ramachandran plot contains 91.96% favored, 8.04% allowed, and no outliers. Structure figures were generated with Chimera, Pymol (RRID:SCR_000305, The PyMOL Molecular Graphics System, Version 1.8 Schrödinger, LLC. ), APBS (RRID:SCR_008387) (Dolinsky et al., 2004) and HOLE (Smart et al., 1996). Structure calculations were performed using the SBGrid suite of programs (Morin et al., 2013). Two different lipid compositions were used for reconstitution. One contains 1-palmitoyl-2-oleoyl-sn-glycero-3-phosphoethanolamine (POPE) and 1-palmitoyl-2-oleoyl-sn-glycero-3-phospho-(1'-rac-glycerol) (POPG) (Avanti Polar Lipids, Alabaster, AL) at a 3:1 wt ratio. The other contains 1-palmitoyl-2-oleoyl-sn-glycero-3-phosphocholine (POPC), 1,2-dioleoyl-sn-glycero-3-phospho-L-serine (DOPS) (Avanti Polar Lipids) and cholesterol at a 8:1:1 wt ratio. The lipids were mixed in chloroform and washed with pentane. After drying with an argon stream, the lipids were incubated overnight in a vacuum chamber. Dried lipids were suspended by sonication in buffer containing 20 mM Tris pH 8.0, 150 mM NaCl, and then mixed with 1.3% C12E10 for 2 hr at room temperature, to make final lipid concentration 20 mg/ml. Mouse Piezo1 was purified following the same protocol as described above, except replacing digitonin with C12E10, 2% (w/v) and 0.025% (w/v) for extraction and stabilization, respectively. Purified protein was added to the lipid/detergent mixture in a protein-to-lipid ratio of 1:20 (w/w). Following 1.5 hr incubation at 4°C, C12E10 was removed by incubating the mixture with SM-2 bio-beads (Bio-rad, Hercules, CA) overnight at 4°C for the POPE:POPG vesicles, and by dialyzing against detergent-free buffer for 4 days at 4°C for the POPC:DOPS:cholesterol vesicles. Generated proteoliposome vesicles were collected and briefly sonicated before freezing on C-flat 1.2/1.3 400 mesh Holey Carbon grids for the POPE:POPG vesicles, and Quantifoil 400 mesh gold R1.2/1.3 holey carbon grids for the POPC:DOPS:cholesterol vesicles. Micrographs were collected on a Talos Arctica transmission electron microscope (FEI) operating at 200 keV equipped with a K2 Summit direct electron detector (Gatan), in super-resolution mode, with a nominal defocus range of 0.8 to 2.4 μm. The calibrated physical pixel size is 1.5 Å for the POPE:POPG vesicles, and 1.9 Å for the POPC:DOPS:cholesterol vesicles. The exposure time for each image was 10 s fractionated over 50 frames, with a dose rate of 8 electrons per physical pixel per second for the POPE:POPG vesicles, and a dose rate of 15 electrons per physical pixel per second for the POPC:DOPS:cholesterol vesicles. Whole-frame motion correction was performed with gain reference applied and dose weighting using MotionCor2. Atomic coordinates of mPiezo1 have been deposited in the Protein Data Bank (http://www.rcsb.org) under ID 6B3R. The cryoEM maps (refined in cryoSPARC with C3 symmetry and focused-refined in RELION with C1 symmetry) have been deposited in the Electron Microscopy Data Bank (https://www.ebi.ac.uk/pdbe/emdb) under ID EMD-7042. Genetic Diseases of PIEZO1 and PIEZO2 Dysfunction, Current Topics in Membranes, Elsevier. Journal of Structural Biology 184:226–236. The Journal of General Physiology 136:483–494. Acta Crystallographica. Section D, Biological Crystallography 66:486–501. Mechanosensitive channels: what can they do and how do they do it? Zeitschrift fur Naturforschung. Teil C: Biochemie, Biophysik, Biologie, Virologie 28:693–703. Journal of Molecular Biology 338:1027–1036. Journal of Molecular Biology 427:54–66. Nature Structural & Molecular Biology 17:133–138. Journal of Structural Biology 192:216–221. Annual Review of Physiology 59:633–657. 37–70, Role of Lipid Bilayer Mechanics in Mechanosensation, Mechanosensitive Ion Channels, Dordrecht, Springer. Trends in Biochemical Sciences 42:57–71. Thank you for submitting your article "The structure of Piezo reveals a "molecular touch dome" poised for mechanosensation" for consideration by eLife. Your article has been reviewed by three peer reviewers, and the evaluation has been overseen by Kenton Swartz as the Reviewing Editor and Richard Aldrich as the Senior Editor. The following individual involved in review of your submission has agreed to reveal his identity: Nikolaus Grigorieff (Reviewer #3). The authors present a near-atomic-resolution model of the mechanosensitive mouse PIEZO1 channel. While the overall architecture of the channel broadly resembles the trimeric, three-bladed propeller of the 2015 medium-resolution structure published in Nature, this new structure represents a very significant advance and should be an invaluable tool for future structure-function studies. Strikingly, the three "arms" surrounding the central pore domain point up at a ~30 degree angle making it impossible for them to reside in a planar membrane. To see if this arm orientation is preserved when the channel is embedded in a membrane (rather than the detergent micelles used for the structure determination), the authors image channels reconstituted into small unilamellar vesicles and conclude that in the closed state the channel arms distorts the membrane into a tightly-curved (R = 10nm) dome-shape. They then propose that these arms rotate to a flatter geometry in the open state, as the large (~50 nm2) increase in projected membrane area make then make the channel exceptionally sensitive to changes in membrane tension. Overall, this is an important and fascinating study that will have major impact on the field of mechanosensation, and as such is highly appropriate for publication in eLife. The following are points the authors should address in revision. 1) The authors present just a single image of a distorted small unilamellar vesicle (Figure 5D) to support their hypothesis that the channel reshapes the membrane into a tightly-curved dome shape. However, the shape of vesicles in cryo-EM images is very sensitive to sample preparation (e.g. Methods in Enzymology, Vol 391) and the example in Figure 5D appears as if it could be partially dehydrated. To exclude these effects, the authors could present images of multiple vesicles containing Piezo1 along with control vesicles (i.e. no protein, or with a planar protein like bR) and quantify the curvature of the phospholipid head-group contour in the vicinity of the electron density of the CED. Also, we imagine the authors have already considered opening the channels by intentionally increasing the solution osmolarity (and thus vesicle membrane tension), but perhaps the change in "dome shape" is too small to resolve? 2) The authors' model (Figure 1 and Figure 7) only considers the effect of the average lateral force within the plane of membrane (i.e. tension). While the osmotic-release function of MscL only requires it to sense these lateral forces, there is quite a bit of evidence suggesting that eukaryotic mechanosensitive channels are subjected to vertical forces perpendicular to the plane of membrane via interactions with the cytoskeleton, extra-cellular matrix and even the hydrostatic pressure difference between the cytosol and extra-cellular fluid. Thus, it would be helpful if the authors compared the coupling of their proposed dome flattening/arm rotation to pN-scale vertical forces to the lateral forces they have already considered. 3) The authors made some change to the standard image processing protocol to enhance the resolution in the N-terminal domains forming the somewhat flexible arms of the triskelion. This "symmetry expansion" should be explained in more detail. 4) The authors spend considerable space providing a detailed model for how pushing on the "dome" might open the channel and contrasting this proposed mechanism to gating of MscL. Although elegant, the presentation of the dome model tends to undervalue the physiological niche where these molecules normally reside. It would be helpful for the authors to discuss how factors, such as cytoskeleton, lipid composition, co-factors and/or ECM binding, might be factored into their model. Indeed, there are already several published studies on Piezo channel regulation in the literature that could and should be incorporated or discussed in more detail. 5) It would be helpful to have a diagram highlighting the locations of unresolved intracellular loops, similar to what is shown for the N-terminus. Unlike normal proteins, these intracellular loops can be quite big (over 100 amino acids) and knowing where there still exist gaps in the structure would be useful. We estimate a maximum possible in-plane expansion (ΔAproj) of 120 nm2. The true value is likely to be smaller as the 120 nm2 estimate is an upper limit. We have addressed these concerns by adding images of vesicles consisting of a different lipid composition in which vesicles are spherical in the absence of Piezo (Figure 6B) and show local deformation in the presence of Piezo (Figure 6C and Figure 6—figure supplement 1). Images with dashed circles are included to highlight the local deviations from the global curvature of the vesicles. We provide additional text to present these data in the section entitled “Membrane curving properties of Piezo”. Thus, we only consider the average lateral force because, based on this unusual structure and its ability to curve the membrane into a dome, we can explain mechanosensitivity on the basis of it alone. We do not exclude the possible existence of other forces with components normal to the membrane plane. However, because we are describing a new possible mechanism for mechanosensation, we wish to focus on it and explain it clearly. We reiterate this point in the revised, final paragraph. We have added a more complete description of the symmetry expansion in the section entitled “Image processing and map calculation” in the Materials and methods section. Regarding the physiological niche, it seems possible that different cells by virtue of their shape, attachments to other surfaces, membrane lipid composition (see response to point 1) and other factors can create more or less favorable environments for the function of a channel that operates by the mechanism we are putting forth. To invent an example, a cell with lots of excess, untethered surface area would seem to leave membrane dome mechanism channels permanently closed. A cell in which the membrane (or parts of it) are somehow held on the edge of zero tension would seem better poised for activation of membrane dome mediated channels. The problem is, at present we do not have enough information about such niches. Our goal is to propose a principle by which this channel might work. That’s all we are trying to do here. We already referenced papers trying to address the role of cytoskeleton and stated our opinion of them. We added dotted lines to Figure 3A that are in approximate length proportional to the number of missing amino acids. These missing amino acids are listed explicitly in Figure 3—figure supplements 1–3. We thank A. Patapoutian for the mouse Piezo1 gene, members of the MacKinnon lab for assistance at various stages of the project, C-H Lee for assistance in image processing, X Tao for advice preparing figures, Y-C Hsiung for help with cell culture, M Ebrahim and J Sotiris for support in data collection, G von Heijne, R Phillips, J Chen, K Swartz and S Scheuring for helpful discussions and manuscript review and AB for inspiration. RM is an Investigator in the Howard Hughes Medical Institute. © 2017, Guo et al. Near atomic-resolution structures have provided insights into the mechanisms by which the Piezo1 ion channel senses and responds to mechanical stimuli.